View of Kelso Bridge and Abbey in Scotland. 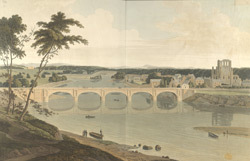 The bridge which crosses the River Tweed was designed by John Rennie of Haddington and was built between 1800-1803. The stone bridge was built to replace an earlier one which had been swept away during a flood in 1797. Rennie later used the bridge as a model for his design of Waterloo Bridge. A toll house was built on the Kelso Bridge and anyone using it was charged a fee which would go towards the construction costs. In 1854 townspeople rioted over the toll, complaining that the construction costs had long since been covered. In 1857 as a result of these riots the toll house was removed. The Abbey at Kelso can be seen to the right of this print.